Have you ever visited Bulgaria? How did you like it? Share your experience in comments with us! Bulgaria is off the beaten path for most western travelers and that is a shame, as the country is beautiful and quite inexpensive. Black Sea beaches attract sunbathers in the summer months, and there is top notch skiing available at the mountain resorts of Bansko, Borovets and Pamporovo. Many travelers never make it to Sofia, the capital and largest city of the country. Sofia is located at the foot of Mt. Vitosha, which gives residents the possibility to ski just minutes away from home. For visitors, sightseeing opportunities abound in the city center and most of the touring can be done by foot. Sofia is developing quickly, with modern offices and apartment buildings, and large shopping malls offering everything under the sun. Even so, horse-drawn wagons still make their way along cobblestone streets, Russian-made Lada cars are seen frequently, and there are numerous open air markets, giving a strong sense of Old World traditions. The city boasts huge expanses of green parks, the spaceship-like NDK cultural center, many museums and galleries, and striking architecture. I had the amazing opportunity to live in Sofia for two years and highly recommend the city to visitors. A short visit to Sofia is extremely worthwhile, and affordable. Sofia is the hub of Bulgaria’s government as well as home to most of the country’s cultural activities. The city’s history dates back to the 5th century BC, and ruins of the ancient settlement of Serdica can easily be seen in the pedestrian passageways under the street intersections in the very center of the city. Many of the golden Thracian treasures from the country’s past are on display at the National Historical Museum (outside the city center). Almost all of the main tourist sites are located in Sofia’s center. Among the highlights is the St. Alexander Nevsky Cathedral, constructed in the late 19th century to honor Russian soldiers who died while fighting for Bulgaria’s liberation from Ottoman role. The cathedral, with its gold domes, is probably the main symbol of the city. The 4th century Rotunda of St. George is considered the oldest building in Sofia, and is located right behind the Sheraton Hotel. Not far away is the Sofia Synagogue, the third largest synagogue in all of Europe. The gold-tiled streets of the Largo lead past symbols of Sofia’s socialist past – the National Assembly, the Central Department Store, and the President’s Office. The cheapest way to see all of the Sofia sites is by taking a Free Sofia Tour. This English-language tour, starting at 11 am and 6 pm at the Palace of Justice and lasting around 2 hours, will take you to the most important city sites, including the Sveta Nedelya Church, the Banya Bashi Mosque, Sofia Synagogue, Ancient Serdica Open Museum, the Rotunda of Saint George, the National Art Gallery, the Ivan Vazov National Theater, the Russian Church, the St. Alexander Nevsky Cathedral, and the National Assembly. No reservations are necessary, just show up! I fell in love with Sofia’s restaurants, which feature both international cuisine and local Bulgarian favorites. Inexpensive street fare includes pizza by the slice, cups of corn kernels, and banitsa, a breakfast-time filo dough pastry. A cheap chain of wholesome restaurants is the Happy Bar & Grill with two locations in the city center. Other inexpensive restaurants include Fly Bar and Diner, Mr. Pizza, and Pizza and Restaurant Ugo. Restaurants in Studentski Grad, the student campus area for most Sofia universities, are even cheaper. Rolled or stuffed cabbage leaves and bell peppers, grilled meat, and pastries with cheese filling. Photo by Vesela Tabakova. At sit-down meals you can expect to pay 4 – 5 BGN ($2.67 – $3.30) for a salad, 4 – 10 BGN ($2.60 – $6.70) for a full-size pizza and about the same price for the many chicken or pork dishes offered on the menu. A plate of Banitsa- the most popular breakfast foods (often consumed as a dessert or a snack when made with a fruit filling). It is made of homemade dough or with ready-made filo pastry with various fillings (cheese, spinach, pumpkin or rice). Photo by Vesela Tabakova. If you like to drink, there is no shortage of pubs and bars in Sofia to quench your thirst. Many English speakers gather at J.J. Murphy’s, a traditional Irish pub with live music, sports events, and special offers. In the city’s pubs a half liter mug of beer should cost about 2.50 BGN ($1.67), while in the nightclubs drinks are more expensive. Quite possibly the best way to discover Sofia’s nightlife is by taking the New Sofia Pub Crawl. You’ll be joining locals as they make their way to favorite pubs, bars, and clubs. The nightly crawl begins at 9 p.m. in front of the statue of Stefan Stambolov in the middle of Park Crystal. The price is 20 BGN ($13.30) and includes some free drinks and access to places you wouldn’t dare enter on your own. The Canapé Connection Hostel is located not far from the city center, and is pictured below. The hostel offers what are reportedly the widest hostel beds to be found anywhere, and they are available in private rooms (30 BGN / $20 per person) or in dormitory rooms (20 BGN / $13.30 per person). There’s a 10% discount for ISIC (International Student Identification Card) holders. The price includes homemade breakfast, unlimited Internet access, sheets and towels, and 24-hour hot showers. Another centrally located hostel is the Sofia Guesthouse where dormitory accommodations are available (18 BGN / $12 per person). Lodgings include breakfast, clean and fresh sheets and towels, a free map of Sofia, and use of wireless Internet. 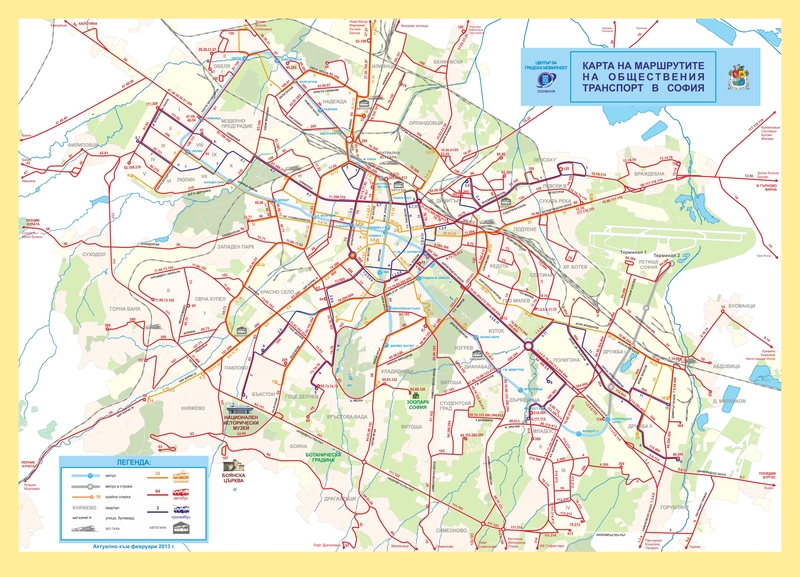 Unfortunately, there is no direct bus line or metro connection to get you to and from Sofia’s International Airport, located about 5 kilometers from the city center. You can take a taxi to the center, but make sure you get into one of the licensed cabs located to the right of the terminal as you leave. The ride should cost about 15 BGN ($10), but make to clarify the fee beforehand as it is always much harder to argue the price once the journey has been completed. Sofia also has international bus and rail links to destinations in both eastern and western Europe. Sofia is primarily a walking city, and most of the major sites can be seen on foot. There are many tram lines and two metro lines that take you into the suburbs. A single ride is 1 BGN ($0.67) or you can buy a 10-ride ticket for 8 BGN ($5.30). Bulgaria should be featured as a travel destination for whoever wants to experience the best that Eastern Europe has to offer, at very affordable prices. Visit Sofia, your gateway to Bulgaria! Sofia is high on our must see list. Why? Because it is in the top 4 of the most impressive yet affordable cities in Europe. Thanks for all the tips! I have a feeling we might be going sooner! I’ve never been to Bulgaria, but if I do I’ll have to eat at the Happy Bar & Grill! Yeah, I did! :) I went there, twice…no, three times! :) It is very cool!! There’s also an amazing cafe at the National Art Gallery. You should check it out if you go there this summer! I will, definitely. Would love to have my latte there :)x, thanks for sharing! Thanks for the post Agness. It looks like Bulgaria is still relatively inexpensive compared to the countries surrounding it that are now in the EU. I’m hoping to explore eastern Europe alot more in the coming years seeing as its actually quite inexpensive to jump on a flight from the UK. If we find ourselves in Poland I’ll make sure I send you an email and see if we can meet up! Sofia… such a nice city! I was there a few years ago and whereas I loved the sights, the weather was totally against me, so I had to cut my trip short. But it’s definitely worth a visit and, indeed, such an inexpensive destination! The bad weather can spoil your journey sometimes, we know something about it, but good to know you enjoyed yourself anyways! I remember finally arriving there and being spectacularly overjoyed at the prices, especially since it was towards the end of a trip and it was great to see prices drop. I especially like the group seating at certain restaurants; the tables are big, and random people will sit down with you. We couldn’t say anything to each other, but we still knew how to do a cheers. Yeah, it’s always great to see prices drop towards the end of your journey, especially when you don’t have much money left. Thanks for sharing, we need to check the tables out in restaurants next time! We were discussing where to go on budget while in Europe. This post came handy, we might now consider Sofia as a distention. From airport you can take the bus line 84 and 384 , to Sofia. Thanks Gabriela for the info. We will keep that in mind! Thank you Gabriel for adding this information. You are correct, there are some bus lines that connect the center of the city to the airport. Tourists may find it a bit more convenient, though, to travel by taxi. Outside of Sofia one can visit the church of Boyana with its stunning frescoes.